Previous: What is the Bloomlife Mind-Body? Your newborn wakes up for the day at 5 a.m. And it’s brutal. You’ve only managed a couple of hours of uninterrupted sleep (maybe! ), and your first thought is how many hours until nap time? For loads of us, sleep is the central challenge of early parenthood. Despite this fact, our culture is uniquely unsympathetic to mothers, especially when it comes to sleep. The parenting blogosphere is not much better. It is awash in posts reminding new moms how precious middle of the night nursing and cuddling with your baby can be, when the rest of the world is soundly and blissfully asleep. Sleep is the central challenge of early parenthood. But our culture is uniquely unsympathetic to mothers, especially when it comes to sleep. But while these posts can help focus our attention on the genuine beauty of those moments–and those tender cuddles can be truly magical–their underlying message can also be downright demoralizing. They say to us, you’re a mother now, Your needs must not only take a backseat but ought to be completely subsumed by those of your baby. The joy of new motherhood should blot out your own suffering. And if it doesn’t, you must be doing something wrong. All these cultural messages can make us feel guilty simply for wanting our babies to sleep better, or even simply for having our own physiological and emotional needs. The problem is not only a lack of compassion–though that is indeed sucky. The problem is this perspective is demonstrably false. Instead, study after study shows that we humans cannot simply tough it out when it comes to a lack of sleep. Nothing about becoming a parent changes this fact. Creating a tiny human does not magically upend our need for sleep. Sleep debt impairs our ability to think clearly. Yes, this might be why you put your keys in the fridge but left the ice cream out on the counter. The effect on our ability to think derives not only from how you slept last night, but from how much total sleep debt you’re carrying around. Consider the findings of a study that tracked postpartum women’s cognitive performance during the first 12 weeks after they gave birth. Their cognition worsened over time, even as the amount they slept at night slowly but steadily increased, because they continued to accumulate sleep dept. Better sleep is not always adequate sleep. Study after study shows that we, as humans, cannot simply tough it out when it comes to a lack of sleep. Moreover, it takes a long time, weeks to months, not days, to pay significant sleep debt back down. So don’t expect that that first magical night of eight hours will restore you to your former self. It takes time. And there’s another important wrinkle: One of the key mental abilities undercut by chronic lack of sleep is our meta-cognition–the ability to reflect on our own thoughts. Thus, we often fail to realize how badly our lack of sleep is affecting us. Remember this point when various people brag to you about how little sleep they need. In all likelihood, they are severely sleep deprived but too impaired to realize how much they are affected. Inadequate sleep suppresses hormones that signal satiety, while raising hormones that signal hunger. It also makes our brain’s reward centers hyper-responsive to sugary, fatty foods. There’s a reason that cookie at the coffee shop seems especially tempting. Lack of sleep raises the risk of postpartum depression and anxiety. We still do not know how much postpartum depression and anxiety results from hormonal changes versus from lack of sleep. But studies consistently find that poor sleep lowers new mothers’ moods, increases their stress, reduces their emotional intelligence, and renders them less able to experience pleasure, all of which can trigger depression. Lack of sleep impairs our brain’s ability to suppress negative, fear-based responses. Normally, higher order thinking centers in our brains suppress activity in our brain’s main anxiety center — the amygdala. This suppression is unconscious — we do not even need to think about it. Until it’s gone. Lack of sleep undercuts this suppression, literally unleashing our fears. 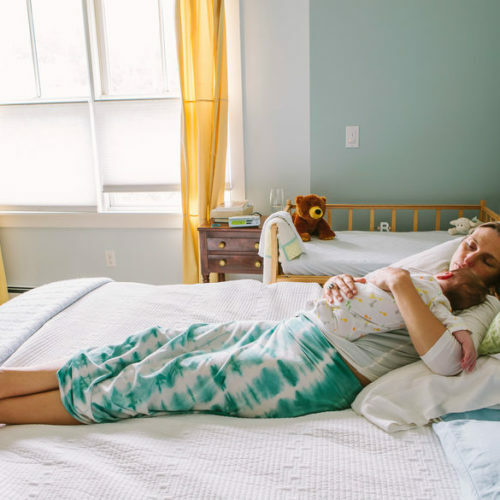 This unleashing may help explain why postpartum anxiety, not depression, is actually the most common postpartum mood disorder. Lack of sleep inhibits our ability to focus and slows down our response times. This is more than just a bummer. The effect can be deadly. Lack of sleep contributes to over 100,000 car crashes every year in the U.S. Reflecting on all of this as a new parent is about as much fun as squeezing lemons into a paper cut. But we need the reminder, because our culture’s deeply dysfunctional tough-it-out attitude towards sleep keeps pretending otherwise, acting as if going without adequate sleep is an achievement. While a lack of sleep is an inevitable downside of becoming a parent, we should never pretend that new parents do not need sleep or that sleep is a luxury. Getting by on inadequate sleep is no badge of honor. It is as devastating to our bodies as gorging on fast food all day. Perhaps more so. 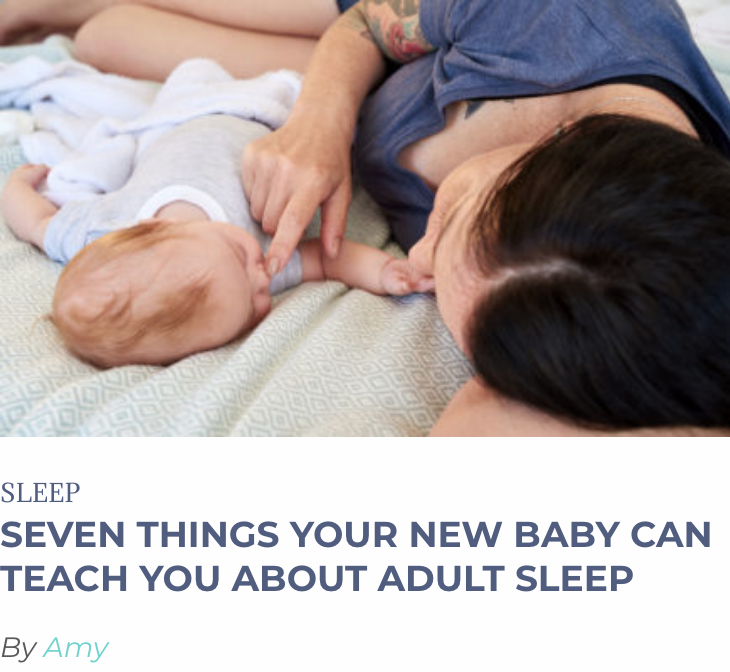 While a lack of sleep is an inevitable downside of becoming a parent, we should never pretend that new parents do not need sleep or that sleep is a luxury. Getting enough sleep is good for parents’ mental, physical, and emotional well-being. And guess what? That’s good for their babies. So let’s stop celebrating extreme self-sacrifice, and start celebrating mothers (and fathers) who shun the martyrdom rhetoric in favor of self-care. P. S. If you are experiencing a pregnancy-related sleep disorder, consider signing up for a sleep study like this one through UCSF. Getting good sleep before baby arrives is just as important (if not more!) and sometimes just as tricky! And if you are suffering from a postpartum mood disorder, don’t hesitate. Reach out for support today. Two Studies Find Postpartum Anxiety & OCD Much More Common.